This incredibly fresh-tasting cranberry, tangerine & crystallized ginger relish came from a food magazine years back, at least fifteen. 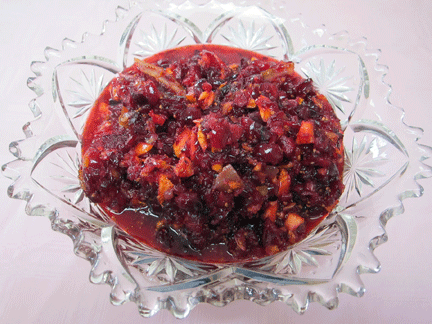 Once I began making this cranberry relish, I stopped making the cooked cranberry sauce recipe that had been used by our family for such a long time. The citrus and candied ginger add a nice spark to the relish. It freezes beautifully, a big plus for my cooking, since I use cranberry sauce/relish in recipes all year long. Surprisingly, the brilliant color survives the freezing. I usually double the recipe, especially for Thanksgiving, and frequently use the defrosted batch with pork tenderloin. LtC TIP: yes, use the whole tangerine, peel and all. 1. Using on/off turns, coarsely chop cranberries in processor. Transfer to medium bowl. 2. Using on/off turns, coarsely chop tangerine in processor. Combine with cranberries. Mix in remaining ingredients. Cover and refrigerate overnight. 3. Can be made one week ahead. Keeps well in fridge and/or freezer. Serve at room temperature. The Best Part of Thanksgiving – Leftovers! This looks delicious! I love the nice chunky pieces. Perfect for Thanksgiving. Thanks for your comment – I need to check out your site! Hey Liz!!! I love this recipe…I am always looking for a fresh cranberry recipe. It’s fresh, quick and easy – what’s not to like? When do you travel to Maui? Happy TG! Me too, I’m a real fan of crystallized ginger – love to nibble on it after a meal -good for digestion! Not “bad me” at all – I know you are busy and welcome you any time! Hey there! I am making this for our t-day dinner…sourcing ingredients on Maui is not easy!